The safety of you, your family and guests is our highest priority. At First Choice Tree Care, our goal is, and always will be, to provide tree care services that keep trees safe, healthy and beautiful. However, there are instances where tree and stump removal is your best or only option. We take great pride in our professional ability to remove trees safely and efficiently. When should you consider removing your tree? Tree removal is the most hazardous aspect of arboriculture. Each year, thousands of people are injured or killed while removing trees. It takes a high degree of training to learn the techniques involved in safe tree removal. Put your trust in our fully insured Wisconsin experts to work safely and efficiently in all aspects of tree removal. It is our practice to perform an expert consultation prior to any tree removal. The following are instances where we are likely to recommend removal. Safety: Hazardous trees that have extensive trunk decay or roots that have been severely damaged either mechanically or by diseases. Declining Health: Dead or dying trees. Storm Damage: Instances where major storm damage has left the tree beyond repair or caused it to become hazardous. Nuisance: The tree has become a nuisance with unusual or excessive dropping of seeds, sap or branches, or is an attractant to insects, such as boxelder bugs. Construction: Tree removal to create space for new construction or home additions. Landscape Renovations: In cases where major landscape renovations will either damage trees or because a tree is not well matched for its location. Tree removal can open vistas or views of the surrounding landscape. Removal can also eliminate competition for light and space for remaining plants to better grow and thrive. Of course, this list is just the beginning. There are many factors that play a role in tree removal that we are happy to help you weigh and consider. Can I do this myself? We do not recommend tree removal by home or business owners. Our ISA-certified arborists have the track record and experience necessary to take down many different types of trees in a multitude of situations. 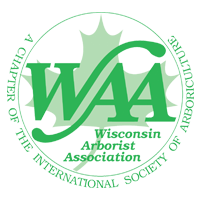 Not only can an arborist safely remove a tree, our Wisconsin experts have the equipment to properly remove branches and wood that would be a much bigger mess on the ground than it was up in the air. Trust us, we do this every day. Contact us today for expert tree removal services. As part of the tree removal process, the stump will typically be left as close to the ground as possible. If desired, removal of the stump can be provided by our ISA-certified arborists. Stump removal can be challenging, back breaking work, but it may be necessary if the stump is an obstruction in the landscape or simply an eyesore. Using our powerful stump grinding machines, we can handle the entire job – from notifying the utility locating service, to repairing the site and seeding grass after the stump is removed. Stump grinding performed by our Wisconsin experts is the easiest and safest way to handle this work. Contact us today for all your stump removal needs.